For the serious runners, take a look at the map and profile below and follow the marshals’ instructions and the tape that will mark the route – you won’t have much time to look around! For those looking to enjoy the scenery and nature on the route, keep reading. The route ranges from an altitude of around 547 m at its highest point, down to around 216 m in the gorge. The start will be on Kloof View Road. Head towards King George Avenue which should provide plenty of space for the fast runners to spread out! Turn right at King George (this becomes Valley Drive) and continue on this road for 2km to the Nkutu Picnic site. As you arrive at Nkutu take a moment to enjoy the new entrance built with the money raised from this event. Funds raised also paid for the re-tarring of the entrance and the garden which is struggling to get into good shape! Take a sharp right turn into the Nkutu Picnic Site (2,3km), through the picnic site (Route-Marker 17) and head for the gorge on the well marked path. 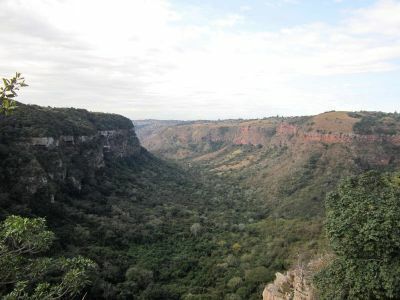 The first section consists of grasslands with the Nkutu Gorge on your left. 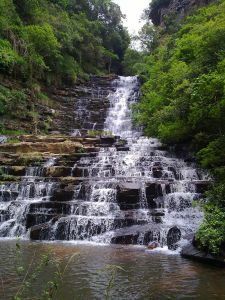 There are two waterfalls in the Nkutu gorge which are accessible from The Nkutu Trail (Red Trail) on the opposite side of the gorge. Along this section you will note one of our BioGuide information labels (Slender Mongoose) which is an innovative information system we introduced a few years ago. Krantzkloof NR is the first nature reserve in South Africa to use this system. Continue on the path to a right turn (3.6km) onto the Forest Trail at Route-Marker 15 – there will be a marshal at this point (it will be Martin Huse and we hope he remembers his left from his right this time – in 2014 he inadvertently sent the runners in the wrong direction and we had to reverse the entire route on the run – it was panic stations to get the marshals to the correct spots but most of the runners did not even notice!). After turning right you run through a grassland section with a fence and private homes on your right. 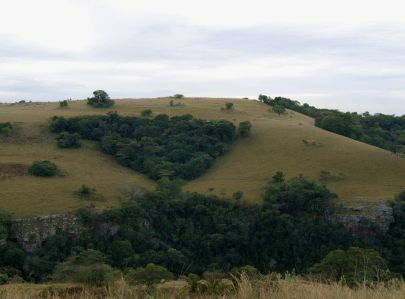 The grasslands are Kwazulu-Natal Sandstone Sourveld grasslands which are now an endangered habitat in the eThekwini metro (and in most of KZN). 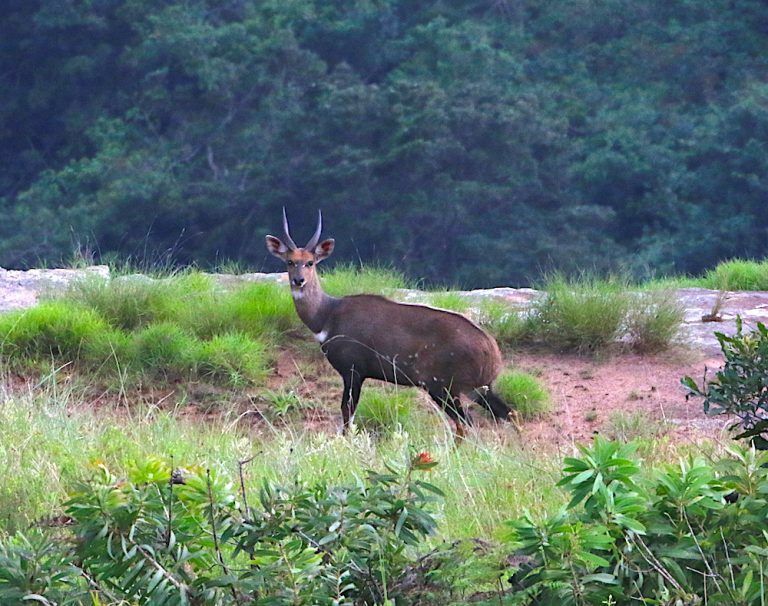 Grasslands have been destroyed by rampant development and less than 0,2% of the original hectares are now left under formal protection in the eThekwini Metro area. The Conservancy is actively involved in rehabilitating and protecting the few remaining patches in Kloof. Sections of the reserve are regularly burnt by the reserve staff. Fire is an essential part of grassland management and some plants rely on fire for their propagation. Take time to have a look at the burnt sections as you will often see some stunning grassland flowers that emerge soon after a burn. The path climbs and then drops to the Ingulube (Bushpig) stream (4,3km) (Route-Marker 18) with a reasonably sharp climb after that. If you did not spot the small Zebra herd in the previous grassland section then you might see them in this section. Once you are at the top of this hill (4,5km) you enter the forest. This is a typical Coastal Scarp Forest and the most common trees are White Stinkwood (Celtis africana), Forest Bushwillow (Combretum krausii) and Umzimbeet (Millettia grandis). 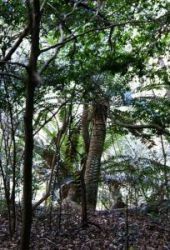 This section of forest has many examples of the Natal Cycad (Encephalartos natalensis) which occur on the forest edges, usually among rocks. At one point you will see a stunning group of cycads on your left which must be quite a few hundred years old. 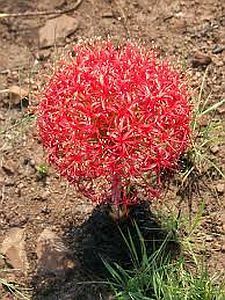 Look out also for some of the smaller interesting plants such as the Haemanthus deformis which is one of three evergreen species of Haemanthus and one of South Africa’s most extraordinary bulbous plants. 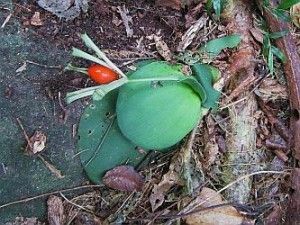 Haemanthus deformis is a protected plant. 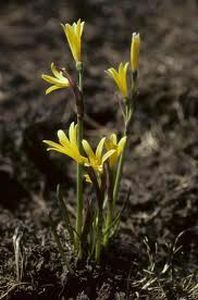 The flower head consists of a dense cluster of erect, white individual flowers with white filaments and bright yellow anthers. The path is well marked and although you are never too far from the edge of the gorge there aren’t any seriously dangerous spots. Half-way through the forest section you will pass Route-Marker 19. You will also come across two sections of sheer rock face on your right and if you do not see any dassies you are likely to smell them because they have numerous middens in this section. There is one spot just before you exit the forest which we have called the Wonder of Ozz – the trail makes a slight upwards left turn and on your left there is a “hole” in a small gulley partly covered by a large rock. If you look down the hole you cannot see the bottom and we reckon that if you were to fall down there you will end up in Perth, Australia! At approximately the 6km mark you suddenly exit the forest into open space and you arrive at one of the wonders of Krantzkloof – The Nkonka Crack. There a number of “cracks” in the gorge and they are the result of the erosion of dolerite intrusions into the sandstone layer – the dolerite is softer than the sandstone and over many centuries has eroded away leaving the gap in the sandstone. 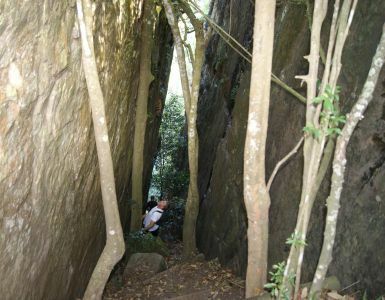 It is essentially a very steep “channel” with towering rock faces on either side which takes you to an intermediate level where you enter a section of riverine forest. A short ladder takes you onto a path which leads you to the bottom of the Nkonka falls (Route-Marker 20) – quite spectacular but in August there won’t be much water. 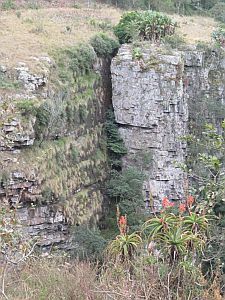 There is a very steep climb after the Nkonka Falls with a short ladder at the very top of the exit from this mini-gorge. Just after the ladder (6,4km) you will find a house on your right with Roman/Greek like garden statues (it belonged to a film producer so he had a sense for the dramatic!) and just after that you are back into an open grassland section. As you climb the steep hill you will note a path heading to your left (Route-Marker 20A) – this takes you to one of the most scenic view spots in the reserve. This is a popular rock-climbing spot but you will have to come back for that on another occasion! At the top of the hill (7km) the path flattens out and at 545m this is the highest point on the trail run. You exit the reserve at Watsonia Place and head up along the tar road to Bridle Road where marshals will assist you to cross the road. Turn left after crossing and after approximately 100m turn right through the pedestrian gate in the palisade fence (Route Marker 21) and continue down the hill and back into the reserve. Follow the path which drops through a dense forest to near the upgraded Krantzkloof Conference Centre (8,5km) at Route-Marker 3. The upgrading was made possible with the funds raised from the trail runs. Turn right at Route Marker 3 and follow the trail to the small wooden bridge over the Molweni at Route Marker No 4. At Route Marker 4 there will be a water table manned by GCS Consultants and we also hope to have some chocolate bars. The trail run turns left over the wooden bridge and then turns immediately right onto the Mpithi Trail. This is the beginning of a short but steep climb past Route Marker 5 and on to a plateau which gives you an excellent view of the upstream section of the gorge. As the trail flattens out you run along a fence line with private properties on your right – the track narrows and in one section there is a very sharp drop on your left so do take care. 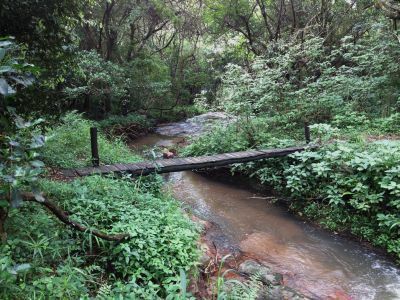 Shortly after that you arrive at the top of the mPithi Falls where there is a wooden bridge over the mPhithi River. We do not expect much water in the stream so we are going to ask you to step across the stream rather than use the bridge which we are trying to protect from damage. This is quite a spectacular spot as you are within a few meters from the edge of the falls and you can look down into the gorge below. 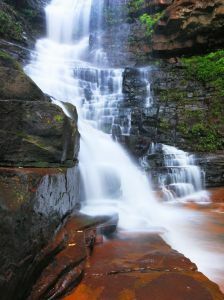 In August there won’t be much water so do come back in summer and see the impressive falls. The trail then winds its way steeply down the side of the gorge until you get to the pool at the bottom of the falls (Route-Marker 6). 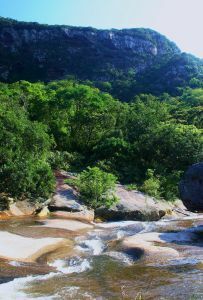 From the bottom of the falls you then follow the trail along the mPhithi river and after about 100 meters you cross over the stream into a section of private property. 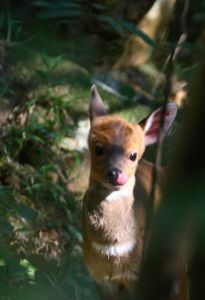 It is not uncommon to spot bushbuck in this area, they browse on the edge of the forest. The trail takes you to a fenced property where you run next to the fence and then across the stream and on to Kloof Falls Road. We will have marshals at Kloof Falls Road but do take care when crossing into the parking at the picnic site as vehicles travel very fast on this section of road! This is most probably the most dangerous part of the trail run! Again take note of the entrance built with trail run funds! There are toilets available (last ones!) at the picnic site. Here you can also see the new information system that we have built with funds from the 3 Falls Trail Run – it should be ready in August 2017! At this point you are approximately half-way through the run. 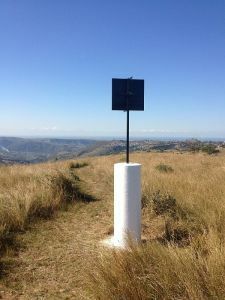 Once through the picnic site (Route-Marker 1) you join the well-worn path of the Molweni Trail. 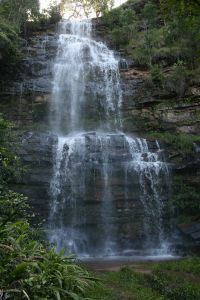 This goes past the main Kloof Falls and the Crowned Eagle’s Nest. Take care as there are some very dangerous drop-off’s on your left near the main falls. We will have tape and marshals at these points. A few hundred meters further along you arrive at a sharp right turn on the path and the view site for the African Crowned Eagles Nest. 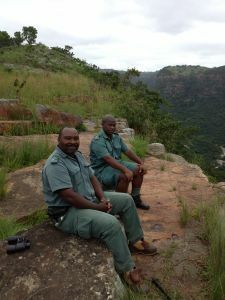 At this point we have marshals (SANParks Honorary Rangers) who will assist you if you would like to have a look at the nest – we do recommend you do! The nest collapsed during a storm in January 2014 but was rebuilt in April 2015. The nest is currently vacant but there is a Juvenile from last season that is still in the area and you may be lucky to see it. 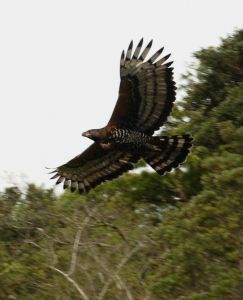 The Crowned Eagle is the largest and fiercest of all the African eagles, although the wingspan of the Verreauxs’ Eagle (formerly Black Eagle), Martial Eagle and Tawny Eagle is longer. The extremely powerful talons are the main killing instruments, not the beak. The hunting technique is very interesting. The birds work together. The female flies low over the trees when vervet monkeys are gathered. The monkeys then all scamper up to the tops of the trees. The male in the meantime has approached from below the canopy. The bird shoots up from below and grabs a monkey, then kills it in flight. (source: Nico Myburgh – http://www.villagelife.co.za/). We will have marshals at this point for those of you that are keen to see the nest – the spectacular scenery is a bonus! Continue over the Ronald’s Kloof weir (Route-Marker 8) and follow the path up to a point where the trail path splits (Route-Marker 8A) – take the Beacon (Orange) Trail which turns right. The path is very rocky in this section so do take care. Approximately 400m after turning right you enter the section known as the Gulley – this is quite a technical section as the path twists and turns and climbs steeply. There is a wooden ladder at the top of the Gulley (Route-Marker 9). 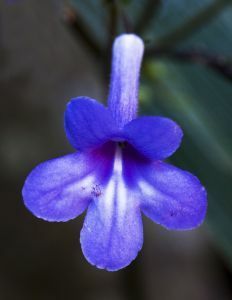 At this point you may note one of the rare plants found in Krantzkloof Nature reserve – the Streptocarpus haygarthii (photo below) – this is a single leaf plant with a dainty blue and white flower. 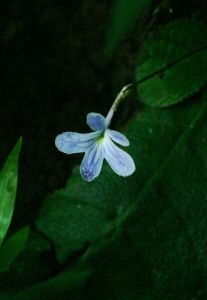 It is one of 5 species of streptocarpus found in the reserve. One of the species, Streptocarpus molweniensis is only found in this gorge so it is very special to us – you will not see it on this route as it is tucked away in the damper more shady parts of the forest. Turn left at the top of the gulley and the path flattens out for a short while and then climbs steeply again and then flattens out as you approach the Zebra gate/barrier which separates the forest section from the grasslands you are about to enter. Once past the Zebra gate/barrier there is a short sharp climb to the Lingwood Trig Beacon (LI-OD 371 – S 29° 46.06 E 030° 50.64) . This point is 499.9m above sea level and one of the highest points on the trail. From here you can enjoy a panoramic view of the gorge and you can look across to where you ran earlier in the day – you will be impressed with what you have already achieved! There is also a good view out to sea and on a clear day you will see the ships parked at sea near Umhlanga. 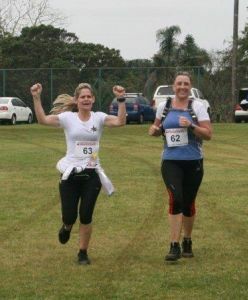 After the beacon it is an easy run downhill through the open grasslands and you will feel great! Approximately 500m after the beacon the path splits. The left path leads you to one of the most spectacular view sites on the gorge known as The Cellar – if you enjoy the run you must make a plan to come back and visit this spot – take a picnic lunch – it is a favourite spot for rock climbers and you get an excellent view of the Uve (Paradise Flycatcher) Falls – but that is for another day! At the split you must stay on the Beacon (Orange) Trail and take the path heading right. This takes you down to the Uve Stream. As you descend you leave the grasslands and enter a riverine forest section where you will note a significant drop in temperature as you cross the Uve Stream. After crossing the stream there is another short sharp climb into the open grasslands near the Uve Road entry gate where you will also find Water-table No2. (Route-Marker 10). This table is sponsored by Don’s Deliveries and will be manned by Kloof Conservancy volunteers. 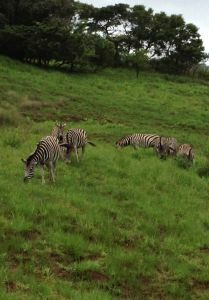 This is also where you are likely to see the Krantzkloof Zebras as they are usually in these grasslands. The outpost at the top of the hill on your right is the Ntombeni Rangers outpost – the money from the 2012 trail run was used to refurbish the ranger’s accommodation at this outpost. In this section you will note a memorial to Greg Bosch who was tragically killed by criminals in the gorge in 2002. Greg was the Environmental Officer with the Outer West Council (a precursor to the current eThekwini Municipality) and was involved in many environmental projects in the Outer West through which he made a significant contribution to protecting our environment. Greg’s wife Jenny is an Honorary Officer for the reserve and will be one of the marshals on the day. After the memorial, the path continues through the grasslands and then makes a sharp left turn at Marker 11. This section is now called the Pumula Trail. This means “rest” in isiZulu. The trail runs downhill and you start a very steep technical and rocky descent. At one point the path turns sharply to the right and there is a view point on the left hand side of the path which gives you a good view of the Uve Falls. There is a large rock at this point which provides a good spot to “pumula”! Shortly after this the path eases and it is a pleasant descent to the Molweni River – enjoy it because The Wall awaits you! The crossing on the Molweni (Route Marker 13) is at a point known as 10-Feet because of the deep pool in the river just below the large rock at the river crossing. It should be an easy hop over the river in August with low water flow. This is a beautiful spot for a picnic! After crossing the stream you will start what is without doubt the toughest part of the run – The Wall. If you have done your training you will enjoy it, if you haven’t you are going to huff and puff and more! The path climbs steadily all the way to the top of the escarpment. 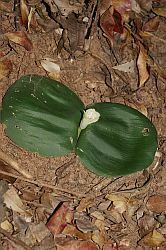 The vegetation here is typical scarp forest and you should look out for the Commiphora harveyi or Red-stemmed Corkwood tree with its very unusual copper coloured peeling bark and very bright green trunk underneath. Along this section you might also hear some very loud wailing noises, almost like a baby crying – no it is not the runners in front of you wailing as they suffer up The Wall! 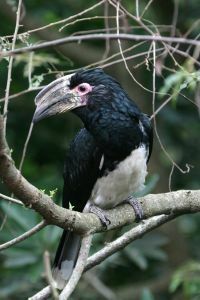 This section is very popular with the Trumpeter Hornbills which are frequently seen and heard in this section. Trumpeter Hornbills are very noisy, gregarious birds and are plentiful in the reserve – it is also the bird depicted in the Kloof Conservancy logo! The last section of this climb is very steep and at a sharp left turn near the top there is a view spot where you can have a short rest! From this spot you get a good view of the lower Molweni valley and its burgeoning population edging close to the reserve. The building with the long green roof is Tholulwazi High School, one of seven high schools the Kloof Conservancy works with in the area. If you look carefully you will also see the Umgeni River in the distance. Continue up the challenging climb past Route-Marker 14 and you eventually get a break at the top of The Wall as you enter an open grassland at the top of the gorge. 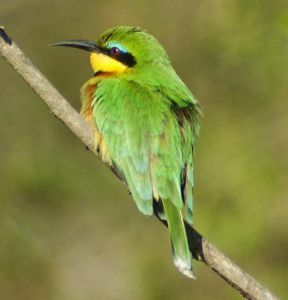 As you exit the forest you may be lucky to see the Little Bee-eater, one of the most colourful birds you will see in the reserve. Shortly after this you take a sharp left turn back on the trail you did earlier in the day at Route-Marker 15. There will be a marshal at this point (Martin Huse again!) and a water-table manned by Riverside Trail Running Club. You then continue through the grasslands, down to the stream and at Route-Marker 18 you turn right climb a short hill and exit the reserve into Kloof View Road. There will be marshals at this spot. 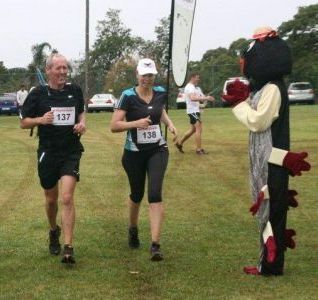 Once on Kloof View road it is a straight run on tar back to the finish at Forest View Primary school where our mascot Rubi-D (pink-footed giant black millipede which is endemic to our area) will be waiting to welcome you! 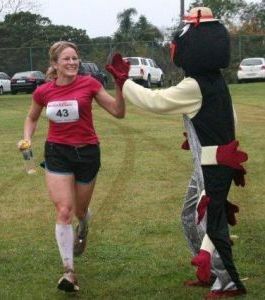 Have a great run and do enjoy our wonderful reserve!